My first day in the Azores, I went up to the breakfast room in my hotel, where several breads, an enormous cheese wheel, and a plate of farmer’s queijo fresco were laid out on a large, heirloom table. But there was only one place setting, and I wondered where all the other guests were. The owner, who spoke perfect English, explained that even though many historic manor houses in the Azores are private homes, the government requires proprietors to house guests on occasion. I, apparently, was the quota. For proof, he asked me to sign the guest book, where the last name was dated September 2005. It had been almost a year. Most of the names were from European countries, with a few from Canada. “I think you’re my first American,” said my host. I then realized the uniqueness of my situation, and became excited over the thrill of being a pioneer of sorts (and the thought of all that cheese just for me). Located at the intersection of three tectonic plates, the archipelago of nine islands that makes up the Azores is actually a series of volcanic peaks of the Mid-Atlantic Ridge, a submerged mountain range running north to south through the Atlantic Ocean. Only four hours by plane from New England and two hours from mainland Portugal, the Azores is the closest point in Europe to the U.S.
A far cry from the Caribbean or even Bermuda, these subtropical islands are virtually unheard of in the U.S. But thanks to a charter company with flights from cities like Boston (my home base) and Oakland—used mainly by Azorean-American immigrants to visit family—travelers like you and me now have the opportunity to explore this emerging destination conveniently and affordably. Although each of the nine islands—São Miguel, Santa Maria, Terceira, Graciosa, São Jorge, Pico, Faial, Corvo, and Flores—has its own personality and unique characteristics, all embrace an agrarian lifestyle made evident by endless cow pastures, farmhouses, and hedges of cobalt and magenta hydrangeas. The islands have a rugged topography made up of volcanoes, many of which are capped with fallen craters that have filled with water and turned into lakes. Geothermal springs and geysers are a common sight, while small towns rest inside valleys or tower on cliffs along the coast. Although you can get around by bus in many places, it’s best to rent a car so you can roll along slowly, exploring all the nooks as you go. I spent a week touring the two islands that have direct flights from the U.S.: São Miguel, the largest island, and Terceira. Both have strong ties to Azorean communities in the U.S. such as those in New Bedford and Gloucester, Massachusetts, as well as in pocket neighborhoods around Boston and in California. Formed over time by a series of volcanic eruptions from 4.2 million to 290,000 years ago, São Miguel, the “Green Island,” was first discovered in the 15th century, and is now the thriving capital of the Azores. The age of eruptions has long gone, leaving behind a carpet of verdant foliage across the entire island. Ponta Delgada, its main city and also the largest in the Azores, is a true urban center rooted in dense history. I checked out the major sites, where I saw architectural examples from the Gothic, Manueline, and Baroque periods, including the 16th-century churches of Sáo Sebastiáo and the convent and chapel of Nossa Senhora da Esperança, and the 18th-century city gates. I later found a covered market selling fresh fish, produce, hydrangea seedlings, and some handicrafts. Adjacent is the Carlos Bernardo cheese shop (9500 Rua do Mercado da Graça) with wheels from all over the islands, including the acclaimed varieties from Sáo Jorge. The shopkeeper will scrape the cheeses with a huge chef’s knife and drop it down on the counter for you to sample. The shop is also a great place to buy wine, tea, and other specialty foods from the islands. After my city walk, I boarded a small motorboat in the harbor for a whale watch, where I saw bottlenose dolphins and pilot whales. São Miguel’s position in the Atlantic makes it a prime location for spotting marine mammals. Depending on the day, you can see up to 11 different species, including the blue whale, the largest animal on earth. Back on land, heading west out to the country, I stopped at the island’s most famous attraction, Sete Cidades, a large crater with two lakes, one green and one blue, and a small village inside. The different colors are due to reflections from the caldera (rim), but I prefer the local legend: Two star-crossed lovers, one with blue eyes and the other with green, filled the crater with their tears at their last rendezvous. Nearby, in a town called Santa Barbara, I lunched at a restaurant called Cavalo Branco, which serves local specialties, including a huge plate of assorted fish, octopus, blood pudding, and spiced sausages like Portuguese linguica. On the side, you get a basket of breads, both sweet and savory, served with young queijo fresco (farmer’s cheese) and chopped red pepper sauce. Another day, going east, I went to São Miguel’s second most popular attraction: Furnas. Also in a crater with a lake, this town is quite special. Near the water, restaurant chefs and home cooks alike come to prepare the cozido (boiled dinner), which is a stew of meats, fish, and vegetables buried in the ground and cooked by steam from a geyser for at least six hours. Diners gather around noon to see the food (stored in large pots with heavy lids) hauled up from the ground and escorted away in minivans to set tables all over town. I sampled my cozido from silver platters at the more upscale Terra Nostra Garden Hotel, followed by a stroll in the 18th-century park of the same name first planted by Thomas Hickling, an American from Boston. Paths wind through avenues of ginkgo trees, flower gardens of camellias and azaleas, and patches of vibrant tree ferns. After testing out the large geothermal swimming pool outside the park’s plantation house, I decided to “take the waters” in Furnas. This sulfur spa town is gushing with hot and cold springs, many with different medicinal qualities. The water is safe to drink and free for the taking; many locals fill up large jugs to take back to their homes. However, be careful where you step, as boiling hot mud pits churn on the ground in places. I spent the remainder of my days on São Miguel riding along the coastal towns and through the interior. The road to the rugged northeastern corner of the island passes by cliffs with cascading waterfalls with some powering a series of rustic watermills at Ribeira dos Caldeirões. In the town of Nordeste, I stopped for a leisurely lunch at Estalagem dos Clérigos, a hotel with tremendous panoramic views of the ocean. Closer to Ponta Delgada, a small seaside village and the island’s first settlement, Vila Franca do Campo is famous for cottage-industry ceramic makers, as well as artisan cupcakes. I brought back a box of the Queijadas do Morgado treats for friends, who declared them amazing. For lunch that day, I was allowed to pick out my own fresh-caught fish at Estrela do Mar, an alfresco dining spot overlooking the sea. Other culinary escapades during my journey included a green tea tasting and a tour at the tea factory at Gorreana, a visit to the Augusto Arruda pineapple hothouse, where I tasted rich pineapple liquor, and a personal look inside the daily activities of fermenting and bottling other fruit liquors at the Muther de Capote passion fruit factory. Terceira, a short plane ride away from São Miguel, was the third island to be discovered. For centuries, it served as an important port-of-call for the Atlantic sea trade. Today, it has developed its own culture that’s rooted in the colorful festivals and bullfighting. Upon arrival, I rode into the city of Angra do Heroísmo, a UNESCO world Heritage site, which was preparing for the festival of Sanjoaninas (in Portuguese only). Every main street was lined with bright banners or arches strung with what resembled large buttons in the shape of flowers. There was a float, parked in the Praça Velha (Old Square), showcasing an oversized pitcher of milk and loaf of bread, a representation of the traditional offerings during festival times. To get a better view of all the activity below, I climbed Monte Brasil, a volcano that serves as a foundation for one of two fortresses constructed to protect the bay and trading ships from the West Indies. The Castle of São João Baptista, built by the Spanish in 1592, covers much of the mountain. I walked along the massive basalt ramparts, examining all the foliage and wildlife such as deer that thrive within the parkland. The other fortress across the bay, the Castle of São Sebastião, is also from the 16th century but much smaller. Recently, it was converted into a pousada, where guests can spend the night. Away from the city, my car was forced to halt in a tiny village to make way for a very different festival. Holy Spirit Festivals take place on the eight Sundays following Easter, and involve a procession to bring food offerings to the poor, followed by an outdoor meal of soup, meat casserole, and sugar cake. A symbolic crown of the Holy Spirit gets passed around to different families chosen by lottery. When not in use, it’s stored in one of 68 impérios (small chapels dedicated to the Holy Ghost) scattered through the island. Circumnavigating Terceira, I visited two other towns. In Biscoitos, in the north, I toured a wine museum and had a tasting. Azorean wine production is different from any other, where vines are grown in protective stone corrals. Vineyards stretch out to the sea, leading up to a naturally heated swimming pool surrounded by lava rock. In Praia da Vitória, there was a bullfight, which is very different from those in Spain where the matador kills the bull. And, unlike many of Terceira’s tourada à corda (bullfights) where men are chased by bulls in town (often running into taverns and other buildings), the one I saw in Praia happened on the beach. The fight was more like a friendly tug-of-war between man and bull. The bull was tied to a rope held securely by cowmen. People took turns tempting the bull to chase after them, and then ran for dear life. A few times, the bull ran right into the ocean, while the crowd cheered. That night, I settled in at my hotel, which is set on a working farm called Quinta do Martelo, designed to educate visitors about life on an Azorean homestead. At last, I was able to relax in the on-site restaurant, where I was served a traditional home-cooked dinner of kale soup and stew. During the meal, a group of folk musicians led a sing-a-long. Although the words were in Portuguese, I joined right in with the chorus. The Azores is surprisingly affordable for a European destination, with reasonable transatlantic flights and shockingly low hotel rates. Food was also quite inexpensive. I don’t think I had a lunch that cost more than €15. Most of the activities are completely free to the public or charge nominal fees such as the €4 admission at Terra Nostra Garden. And when it comes to shopping, all I need to say is that you can buy a good bottle of wine for less than €5. Try Frei Gigante or Terras de Lava; both are produced regionally. 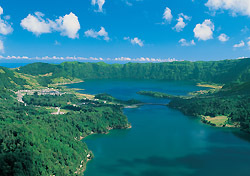 Azores Express, part of the SATA Group, offers direct flights from Boston, Providence, and Oakland, all airports near sizable Azorean-American communities. Nonstop flights to Ponta Delgada, São Miguel, start at $379 round-trip from Boston or Providence, while fares to Terceira start at $549 from Boston and $999 from Oakland, plus taxes. SATA also has regular flights from Toronto and Montreal. If you’re flying from other departure cities, you might consider booking a flight to Boston or Providence, then continue on Azores Express, rather than going direct with a major transatlantic carrier, which could cost well over $1,000 and take more than 20 hours each way (as these flights are routed through Lisbon and other cities). Casa Glória ao Carmo is located a few miles east of Ponta Delgada and provides a truly unique experience. While manor houses are interesting and offer affordable accommodations, usually costing less than €100 per night, there are plenty of similarly-priced modern hotels throughout the islands. Hotels from Bensaude Tourism (such as the Terra Nostra Garden Hotel and Estalagem dos Clérigos mentioned earlier in this article) and the Holiday Inn Azores have teamed up with Azores Express to offer cost-effective air-and-hotel packages. Pousadas provide a lodging alternative, offerings rooms (often very trendy) in restored monasteries, castles, and even fortresses. The new pousada at Castle of São Sebastião in Angra, for example, has rates from €105. Quinta do Martelo, which is considered a rural tourism experience, costs only €92 per day for a single and €100 for a double. Prices can be higher during the summer high season. For more information on planning a trip to the Azores, spend some time surfing the Visit Azores website.